The 2013 CoreTrac User's Conference will be held April 25-26. More info to the right. Remember- training videos are available on our secure website for download. We're on Facebook, LinkedIn, and Google Plus! Follow us for the most up-to-date information and sales culture tips. Forgot a few tips and tricks? View previous newsletters at our secure website. If you have a change in your R1 Administrator or if you have any other contact-related updates, please click here. For service questions, email us at support@coretrac.com OR call us at 512.236.9120 option 1. For sales questions, email us at sales@coretrac.com OR call us at 512.236.9120 option 2. Mark your calendars! The 2013 Users Conference will be held April 25-26 in Austin. The conference and Thursday's happy hour will be hosted by Austin's newest premiere meeting and entertainment complex- TopGolf. Click here to learn more about the venue. Information coming soon regarding accommodations. Look for a separate email with specifics regarding the conference. We look forward to seeing all of you! Any questions regardings the conference can be directed to Molly Richardson, marketing coordinator for CoreTrac. She can be reached at mrichardson@coretrac.com or (512) 236-9120 ext. 263. The CoreTrac Support Team is dedicated to providing prompt response and resolution to any training or technical needs of our clients. To ensure all of your needs are met, please submit all requests by emailing support@coretrac.com or calling our support line at 512.236.9120 option 1. Your service requests will be acknowledged with an email response that includes a support case number. For faster follow-up, please use that case number when requesting updates on your service case. Marketing Lists can be found and created by going to Marketing > Marketing Lists. Select the Marketing Lists link. This page will display all marketing lists that have already been created. 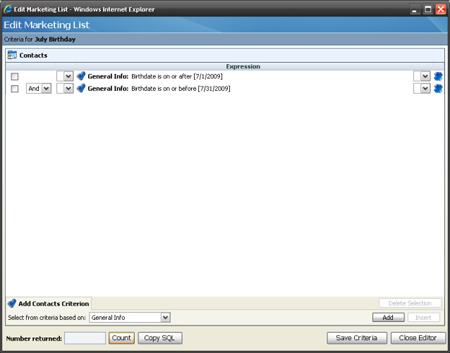 From this page you can select any existing list, open lists and run reports to display those lists, edit existing list criteria or create a new list. 2. Fill out the details for the list you are going to create. 3. Once the New Marketing List is filled out, select the Save button at the top. 5. The Edit Marketing List page will open a pop-up window allowing you to add the criteria for your list. 6. Select the criteria group from the bottom left dropdown. Once you pick your first filter group, select the Add button to the right. 7. A new page will pop-up and display the field options for the criteria group you selected. Pick the fields you would like to filter and define your criteria for the list. 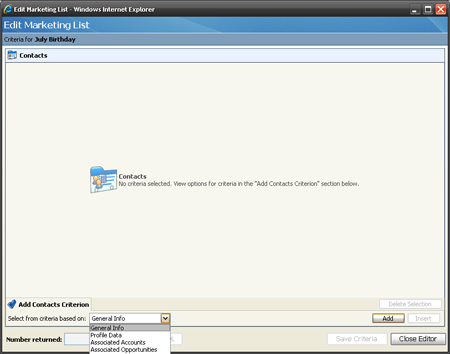 When complete, select the Add Criteria button at the bottom of the page. Additional filters can be applied by repeating this step. 8. Now you will see all of the filters you have added on the main Edit Marketing List page. From this page, you can select the blue “X” to the right of each filter to remove any filter that you do not want. 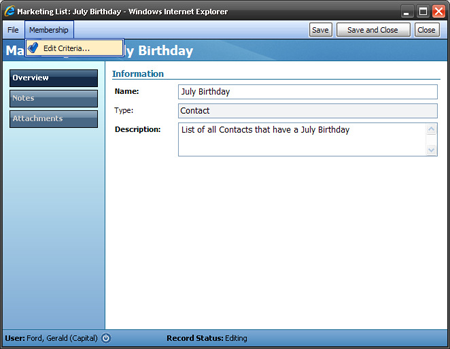 You may also group certain filters by selecting the “(“and “)” in the drop downs on either side of the filter. 9. Once you have added and verified your filters, select the Save Criteria button at the bottom of the page. You will then be prompted that your marketing list criteria has been saved. If you would like to see the number of contacts returned from the filters you have applied, select the “Count” button at the bottom of the page. 10. Select the Close Editor button at the bottom of the page to close the Edit Marketing List page. Client Relationship Management (CRM) isn't just a fancy sales tool for large enterprises. Today, businesses of all sizes, especially community financial institutions, know that a CRM/sales tracking automation application can help attract new clients, generate sales, improve service, and make the difference between profit and loss. In fact, having CRM/sales tracking technology in place can have a significant impact in overcoming the challenges that community financial institutions face today. Your onboarding efforts can serve as a great example. Did you know the average U.S. household has 8.2 accounts, but the average financial institution has just 2.5 of those accounts? The first few days and weeks after a client opens an account at your FI are crucial in laying a solid foundation of appropriate products and service that will make this a profitable client that will be retained for a very long time. CoreTrac's ResourceOne can easily transition your efforts from the sales process of winning the new client, to include triggers for ongoing follow-up activities that keep new clients engaged, and ultimately build loyalty. Laying that solid foundation must be done in the early days of a new relationship by welcoming the new client with special offers for services, constant communications for any support issues, and any follow-up inquiries. Read more about Wedbush Bank here.